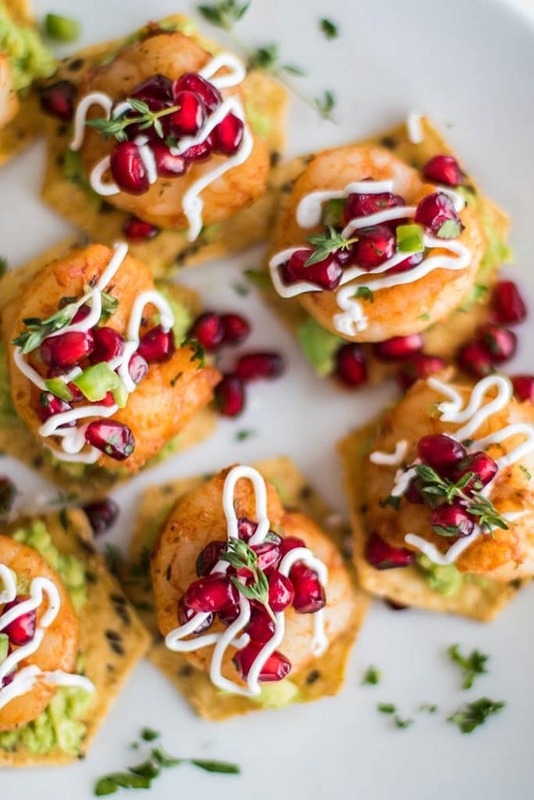 These Mini Shrimp Tostadas with Pomegranate Salsa are the perfect party appetizer! 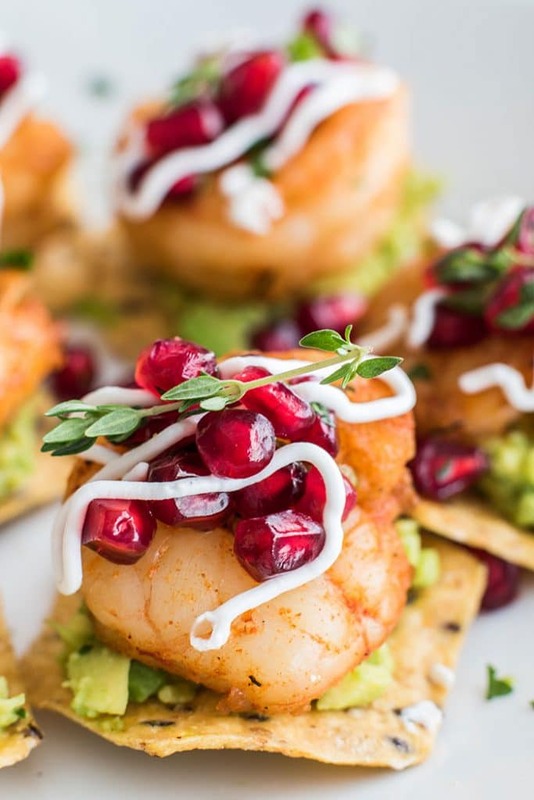 Blackened shrimp are set on a layer of guacamole, and topped with a festive pomegranate salsa. Today I’m partnering with Marina Del Rey Foods – Marina Del Rey sells top quality wild, responsibly caught, frozen seafood. Thanks for supporting me and the brands I work with. Put out a plate of these and watch them disappear. Shrimp are irresistible on their own, but pair them with guacamole and pomegranate, and you have something magical. When I was planning this recipe, I couldn’t get the Pomegranate Guacamole I made last year out of my head. I knew it had to be incorporated somehow. Pomegranate arils are so beautiful, not to mention delicious and fun to eat (and full of antioxidants!). Earlier I posted a recipe for Coconut Shrimp ( <– also made with Marina del Rey jumbo shrimp!). In the post, I outlined some ideas for putting together a quick and easy, healthy party spread. 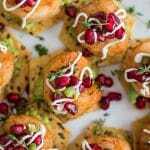 These Mini Shrimp Tostadas with Pomegranate Salsa are a little bit more time consuming, but worth it if you’re really trying to impress! The point of my earlier blog post was to point out how it’s not too difficult to put together delicious and crowd-pleasing snacks that are healthy. Festive food does not have to be full of calories and unnecessary fat and sugar. And it does not have to take a ton of time. Marina del Rey shrimp are peeled and deveined, so all you need to do is pull a bag out of the freezer and run it under cool water for 5 minutes, and it’s ready to use. They are sold at Sam’s Club in a 2 pound bag, and are worth the trip if you love shrimp or are planning on making shrimp for a crowd during the holidays. Marina del Rey’s seafood products are wild caught — meaning better for our bodies, and better for the environment. Marina Del Rey shrimp is not farmed, it thrives in its natural habitat. The shrimp comes from the ice cold waters of Argentina and is free from the chemicals and pollutants found in seafood farms. Wild shrimp eat their natural diet, with no added hormones or color. Wild caught shrimp actually has lower levels of sodium than farmed shrimp. The pink hue is the result of the same pigments that color flamingos, salmon, lobster, and carrots. I used the jumbo shrimp for this recipe, and when they say “jumbo”, they aren’t kidding. I had thought about using the tortilla chips that come as little bowls, but these babies were too big. To give the shrimp a beautiful color and an extra pop of flavor, I sautéed them with some blackening seasoning. About 6 minutes on really high heat is all they need. The shrimp can be prepared ahead of time and put onto the tostadas cold — just as delicious as serving them warm! If you’re a seafood fan, I highly encourage you to pop on over to the Marina del Rey website and see if it’s sold near you! Make it Ahead: To make these ahead, blacken the shrimp up to 12 hours prior to using for the best freshness. Prepare the pomegranate salsa and the guacamole (add extra lime juice to the top of the guacamole, and then press a layer of plastic wrap to cover the top well before storing). Just before serving, assemble the mini tostadas. These beautiful mini tostadas are made with a multi grain tortilla chip, guacamole, and a festive pomegranate salsa. The recipe isn't complete without a jumbo blackened shrimp! Mix together all the ingredients for the blackening seasoning. 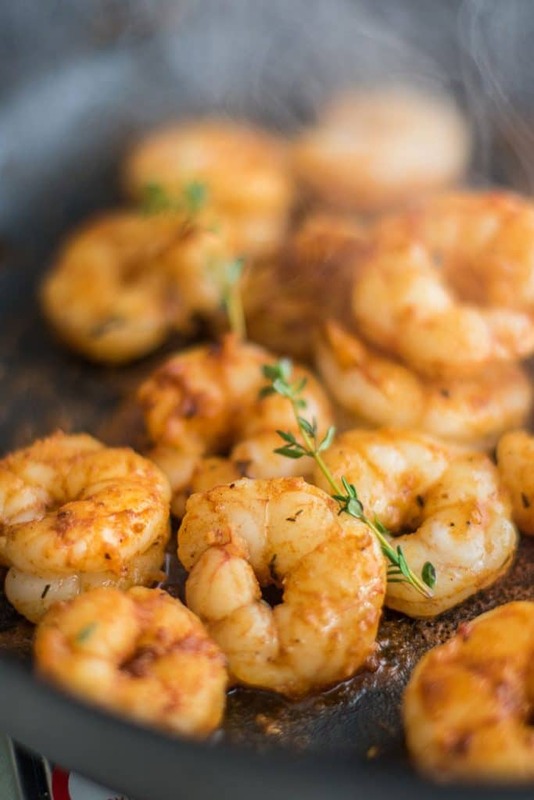 After thawing shrimp, heat a skillet over high heat. Add olive oil, then add shrimp, and coat evenly with blackening seasoning. Start with half of the seasoning, and then add more to taste. Cook shrimp for about 4-5 minutes on one side, and then flip over and continue to cook for 2-3 minutes more. I find the shrimp cook the best if I cook 1 pound at a time, so the pan doesn’t cool down too much when I add them. Prepare the guacamole and the pomegranate salsa in separate bowls by combining all the ingredients. Adjust the salt and jalapeno pepper in both to taste. To assemble the tostadas, lay out tortilla chips, top with a spoonful of guacamole, a blackened shrimp, and a spoonful of the pomegranate salsa. Add a dallop or creme fraiche or greek yogurt if desired. Use a piping bag to achieve the look I did in the photos. Serve right after assembling. If wanting to prepare ahead of time, it's okay to prepare the blackened shrimp and refrigerate and use cold. If you'd like to serve them still warm, simple prepare the blackening seasoning and then cook the shrimp right before serving. The guacamole and pomegranate salsa can be made the day ahead. Squeeze extra lime juice on top of the guacamole and cover with a sheet of plastic wrap, pressing it into the guacamole to prevent browning. Just in time for the holidays! These appetizers look terrific Michelle - I love guacamole, salsas of any kind and blackened spices - so these are for me :) Have a wonderful holiday! It does sound like they'd be a perfect fit for you -- and like we'd be great dining partners! Oh Taylor, these are so fun! I was just planning on making your protein packed charcuterie board :) We are having a toddler gingerbread house party -- the kids will be full of sugar but I wanted something healthy for the parents to snack on! These are absolutely mouth-watering, Michelle, and so perfect for the holidays. I love a shrimp appetizer and you're right, they'll disappear in record time. Sharing all over - wow - I'll be dreaming of these until I get a taste! I was thinking about you when I made them! I don't think I know anyone who loves shrimp as much as you do. I just got back from Mexico and while I'm excited for Christmas I am missing the sunny weather. I'm definitely making this to bring tostadas to our cold Christmas in Canada. Oh, what a great idea! Ooh, Mexico is such a great escape in the winter! The pomegranate salsa -- swoon! So delicious -- spicy, sweet and salty! 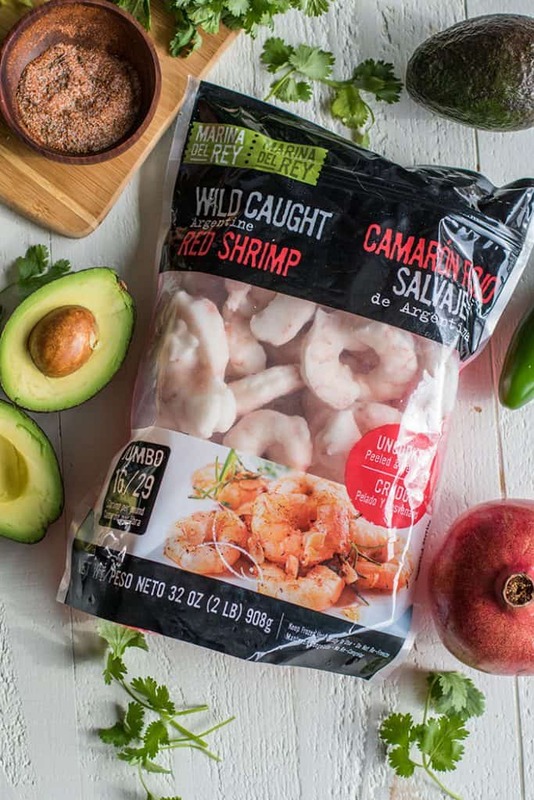 These are delicious -- Marina del Rey shrimp really makes all the difference! Holy COW could these be more beautiful?!! 100% faceplantable and a gorgeous winter appetizer! I could probably eat an entire plate of these as a meal! These little tostadas are so pretty and festively coloured! Very pretty. Thanks Kate! They were fun to make. Can't wait to try these! They are so festive and beautiful! This is exactly the way I love to eat with fresh, spicy-sweet flavors! These are the perfect party bites Michelle and I wouldn't want to walk away from these at a party! I love that pop of sweet and spicy, too! These are totally and utterly adorable! I love everything about this recipe from the blackened shrimp to the gorgeous garnish ~ Marina Del Rey is the ultimate! This recipe has ALL of my favorite ingredients and it looks so cute and festive! Perfect appetizer, Michelle! Thanks Tania! Adding pomegranate to anything this time of year makes it so much better, doesn't it? These are the cutest Christmas appys ever!! I'm so in love with the shrimp and pomegranate seed combo. Will be making these for sure. Also in love with Marina del Rey. They've become our go to for shrimp and scallops! Thanks Kristen! Such a simple idea but they turned out gorgeous. 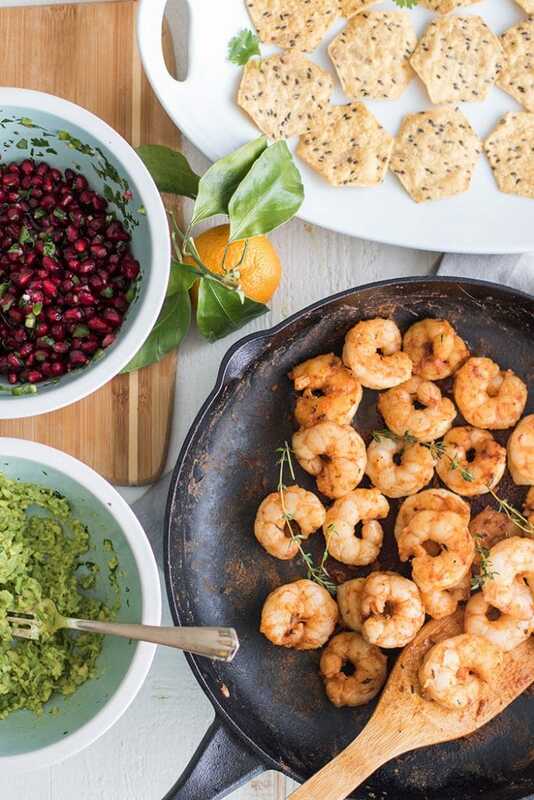 LOVE the idea of blackened shrimp and pomegranate salsa! Yum! Can't wait to try it! The pomegranate salsa makes these! You had me at Pomegranate Salsa! lol Everything looks delish! Thanks Wendy - they are delicious! I love how quick and easy these are to put together! And you basically put all my favorite foods into one dish so I am definitely going to have to make this one! Thanks Tiffany -- all my favorites as well! These little bites look so wonderful! I love shrimp and the sweet spicy combination of flavors going on here! Thank you Amy! We love these bites so much. Yum!! These are so cute and sound delicious! Just in time for my holiday dinner. Awesome :) I've had a few others tell me they are making them this weekend as well! These tostadas are beautiful! Love the blackened shrimp and pomegranate salsa. I think a shrimp appetizer is great for the holidays. Thanks Regina! They are pretty easy to keep eating. And the leftover pom salsa <3! What a festive appetizer! I love the pomegranate salsa on top! Thank you Rachelle! 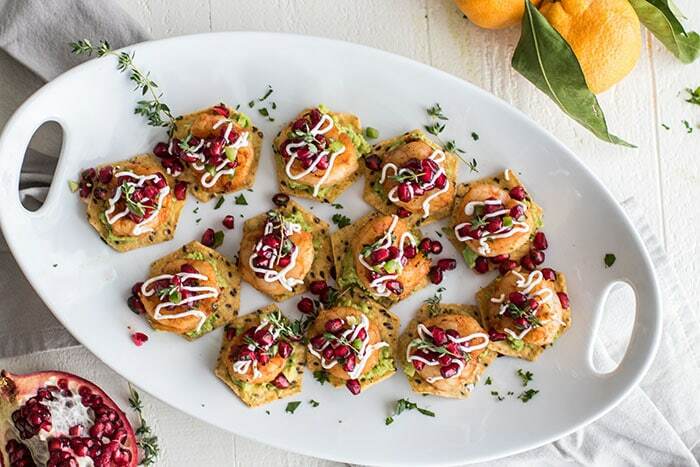 The pomegranate really makes this appetizer special. The shrimp look delicious and the photos are so beautiful I want to jump right in there and tie into those blackened shrimp. They will be such a pretty addition to the appetizer tray. Thank you Marisa! They are so fun, and so delicious! What a delicious sounding, gorgeous appetizer. These are perfect for a holiday party, plus easy to make. Love it! The texture from the shrimp and pomegranate together must be so good. I'm loving the colours too. They are so good together! The colors are stunning. Amazing that you have access to really fresh seafood like that! These are delicious - I hope you both really enjoy them! These look so delicious! Such a perfect party appetizer. Yum! The pomegranate arils are such a gorgeous topping! I'm always looking for new appetizers to make for the holidays. I think this one will be a hit for our annual New Year party and I can't wait to share it with my friends! Thanks for letting me know Jessica! I hope you enjoy it as much as we have been. These are so cute and perfect for party! Pomegranate salsa sounds delicious. Great and vibrant photography! Definitely a must try, since I've never tried shrimp and pomegranate together. Ooh, pomegranate can be added to almost anything! It's so pretty and adds such a great texture.